Vancouver based Otto Van Ewyk was born in Utrecht, The Netherlands in April of 1952. When he was a small boy his family moved to Canada and settled in Calgary, Alberta. Otto's interest in music began early. At the age of twelve he was singing on numerous children's shows and appeared frequently on local television programmes. He played drums in a variety of bands and was a snare drummer with the Royal Canadian Air Cadets. As a vocalist his tastes leaned toward the popular music of contemporary top 40 radio. Just as he was starting to gain recognition in the regional music industry, he left to pursue a business opportunity in the field of security research and development. Nearly ten years ago, Otto decided to re-enter the music business with a newly acquired taste for country music. His ability to be mistaken for superstar singer Kenny Rogers led Otto to pursue the goal of trying to develop a world class presentation based on his physical appearance and a close study of Kenny's voice. The result was more than he could have imagined. After winning every one of the British Columbia talent contests he entered, Otto came to the attention of Vancouver producer Les Vogt, who had been with Roy Orbison's organization for many years. Vogt assembled a show around Otto, and with Las Vegas impersonators doing Willie Nelson, Randy Travis, Dolly Parton and Ricky Van Shelton, The Living Legends of Country Music toured both Canada and the United States for three years. In 1994 Otto decided to cut back on touring and after a brief hiatus formed Sweet Music Man: The Life and Music of Kenny Rogers, giving him artistic and creative control of his incredible tribute to a true music superstar. Born in Houston, Texas, Kenny Rogers was the country music phenomenon of the 1970s and early 1980s. His route to country music was by way of jazz, rock and pop, a background that helped him record a single like Lady, which hit #1 on the pop, country and soul charts in 1980. Country fans had no trouble supporting him and his achievements, and in return, he played a major role in sustaining the country music boom that got under way in the 1970s. In high school Kenny formed a rockabilly group called The Scholars. He signed a recording contract with Carlton Records and in 1958 released That Crazy Feeling and For You Alone which both became regional hits. After a short time at the University of Houston, he left to sing and play bass with a jazz group, The Bobby Doyle Trio. They toured nationally and in 1966 Kenny moved to Los Angeles to join The New Christy Minstrels. After a year with that group he left to form his own group, The First Edition. The group received national recognition with the release of hits like Just Dropped In, Ruby, Something's Burning and Ruben James and even hosted its own television variety show, Rollin' On The River. 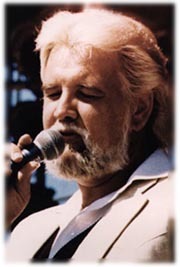 Kenny Rogers left The First Edition in 1975 to pursue a solo career. The release of Lucille in 1977 put Kenny on the path to superstar status. Duets with Dottie West resulted in their being named Best Duo Of The Year in 1978. More hit records, variety specials and television movies followed and by 1980 he was performing more than 200 concerts a year. Duets recorded with Kim Carnes (Don't Fall In Love With A Dreamer) and Sheena Easton (We've Got Tonight) resulted in major hit records. Through the 1970s and 1980s, Kenny Rogers had become one of the biggest performers in both pop and country fields and one of the most recognizable and well-liked celebrities in music. Sandy Collins has been an active member in the Canadian music industry for nearly twenty years. She has performed solo engagements and ensemble dates from one end of the country to the other. The versatility of her voice led Sandy to become involved in varied musical and artistic projects during her career. After a time on Canada's east coast working with different rock and country groups, she moved west to expand her interest in dinner theatre presentations. Her work with Klondike Days and The Calgary Stampede led to a chance meeting with Kenny Rogers impersonator, Otto Van Ewyk. The collaboration resulted in the development of their wonderful tribute to the greatest hits of Kenny Rogers. Sandy's respect and admiration for the great Patsy Cline led to the inclusion of an opening segment of the show highlighting some of the best works from one of early country music's best voices. This opening portion sets the stage for many of the wonderful duets featured in the show. The duets Kenny Rogers performed with the female superstars of country music, who came along a generation after Patsy Cline, were some of his biggest hit records. Sandy's uniquely versatile voice and the experience with shows where she was responsible for the casting of look-a like performers, made her a natural choice for a role in Sweet Music Man: The Life and Music of Kenny Rogers. Dottie West might be called The Queen of Duets because in her long and eventful career she recorded notable material with four different singing partners: Jim Reeves, Don Gibson, Jimmy Dean and Kenny Rogers. Recording with Kenny Rogers brought her career to new heights in the late 1970s. It introduced Dottie West to an entirely new audience of music fans. Every Time Two Fools Collide became a hit record for Dottie and Kenny and led to the release of two gold albums, Every Time Two Fools Collide and Classics, that stayed on the charts for most of 1979. The whirlwind success of this duo brought opportunities to perform in some of the biggest concert halls in the world and bring their magic and chemistry to adoring fans. Vocalist-composer Kim Carnes was born in Hollywood, California and is best known for her 1981 smash hit, Bette Davis Eyes, that remained at the #1 spot nationally for over two months. She was a member of The New Christy minstrels with Kenny Rogers in the late 1960s. Their friendship led to the release in 1980 of the powerful, Don't Fall In Love With A Dreamer. Born near Glasgow, Scotland, Sheena Easton hit the record charts in early 1981 with the #1 single, Morning Train. She won a Grammy Award in the same year and toured extensively throughout 1981 and 1982 on the success of records like, For Your Eyes Only, from the James Bond movie, and Modern Girl, which were both top 10 records. A desire to reach country audiences led to a duet with Kenny Rogers and resulted in the hit release, We've Got Tonight. Dolly Parton was born in Locust Ridge, Tennessee, and made her radio singing debut at the age of 10. Despite what some believe to be her stereotypical public image, Porter Wagoner once said, "Dumb blond is exactly what she ain't." Her first top 10 hit came in 1966 with a song called Put It Off Until Tomorrow. Her big break came in 1967 when Porter Wagoner asked her to join the cast of his television variety show. RCA Records signed her and she had so many hit singles in the next three years that RCA released the first Best of Dolly Parton LP in 1970. She had her sights set on more than just country music, though, and she successfully made the crossover into the pop music field and then on into motion pictures. Her association with Kenny Rogers led to one of the biggest records of her career, the 1983 platinum record release, Islands In The Stream. Sweet Music Man: The Life and Music of Kenny Rogers stars Vancouver based Otto Van Ewyk in a live musical presentation based on the career of one of country music's biggest stars. The two hour performance is a sensational collection of some of the greatest songs to be recorded and released by a phenomenon of popular country music. The commercial success that really began with the song Lucille propelled Kenny Rogers to the status of superstar and he remained there for nearly twenty years. The songs he recorded and turned to gold are all a part of this show. The duets he released with Dottie West, Kim Carnes, Sheena Easton and Dolly Parton are all performed by Otto and featured artist Sandy Collins, along with Otto's full stage band, to add an extra dimension to the thrust of the show. Sweet Music Man: The Life and Music of Kenny Rogers begins with vocalist Sandy Collins performing wonderful renditions of some of Patsy Cline's major hit records. Tunes like Walking After Midnight, I Fall To Pieces and Back In Baby's Arms set the stage for an evening of memorable country music. As the opening segment winds to a close the lights fade to blackness and after a moment the barren stage is lit with only the pale glow of a dim spotlight. From out of the darkness the audience hears..."on a warm summer's evening - on a train bound for nowhere", the band starts to play and, in the person of Otto Van Ewyk, Kenny Rogers takes the stage. Dressed in black, Otto is The Gambler. And so begins the segment of the show that leads the audience on their journey through the career of Kenny Rogers. From Ruben James and Coward Of The County through to hits like Lucille and Ruby, Don't Take Your Love To Town, Otto accurately recreates the image and the sound of one of country music's most recognizable voices. The second show concentrates on the hit recordings Kenny Rogers had as part of a team with some of country music's brightest names. The duets Kenny released with female artists rank among the biggest selling records of his career. From We've Got Tonight, released with Scotland's Sheena Easton in 1983, to the smash hit Don't Fall In Love With A Dreamer, recorded with Kim Carnes, Otto, along with Sandy Collins, celebrates the incredible hit recordings of Kenny Rogers. Through many of the songs he recorded with Dottie West, like Everytime Two Fools Collide and All I Ever Need Is You, up to and including his partnership with Dolly Parton, the music performed is some of the most memorable ever recorded in the field of country music. The second show often draws to a close with a capacity audience on their feet singing along as Otto and Sandy deliver a powerful rendition of the biggest selling record of Kenny Roger's career, Islands In The Stream. Sweet Music Man: The Life and Music of Kenny Rogers accurately recreates the sound and the presence of Kenny Rogers. Otto Van Ewyk is a gifted artist who has devoted years to capturing the humour, the look and the sound of Kenny Rogers. This is a performance that is sure to impress even the most skeptical live audience - an absolute must for every country music fan. "Next to Kenny Rogers it's the best Kenny Rogers show we've seen." "It's hard to believe there could be two of you." "What an uncanny likeness to Kenny Rogers." "Boy, do you look and sound like Kenny Rogers !"